A weekend survey of rank-and-file supporters of Podemos to decide whether the four-year-old anti-austerity party should modify its political branding in the runup to 2019 municipal elections appears to have failed to definitively resolve the issue, with just 16 percent of all Podemos supporters registered online having bothered to respond. 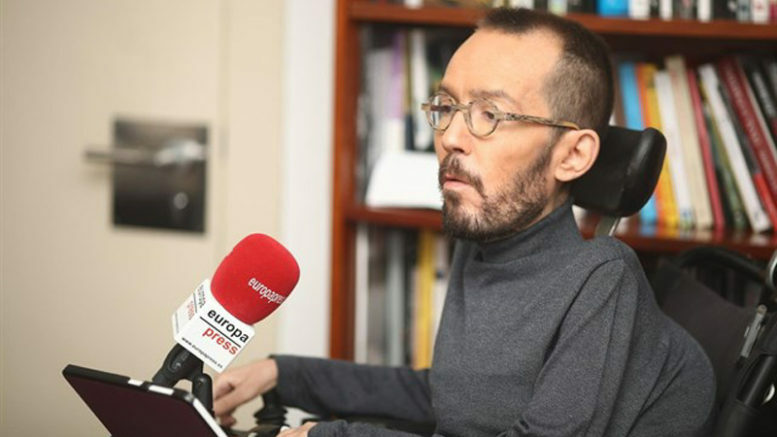 Only 76,511 of the party’s 473,678 registered members and supporters responded to the survey, Podemos’ Organization Secretary Pablo Echenique said on Monday. Putting a more positive spin on the response, Echenique said that the survey participation by Podemos rank and file could be considered to have been as high as 46 percent, if it were measured against the last online consultation that netted 164,020 responses. The online survey of the Podemos rank and file was organized by the executive leadership team of party secretary general Pablo Iglesias, reportedly over the opposition of some regional affiliates of the party and its so-called confluencias of political allies — En Marea (Galicia), En Comú Podem (Catalonia) and Compromís (Valencia). The consultation of party membership and supporters bundled three separate questions on a single online ballot form: first, whether the party should field candidates in the nationwide municipal elections, at all; second, if it should do so in coalition with other parties or political movements; and third, whether the name “Podemos” must appear in any Podemos-backed coalition on the ballot in the those elections. In Spain’s 2015 round of municipal elections, Podemos-backed coalitions scored important victories and won control of the municipal councils and mayoralties of Madrid, Barcelona, Zaragoza, Cadiz and scores of other cities and towns nationwide. The online survey was seen by some within the party as an effort to secure backing for centralized decision making of Iglesias’ national leadership team when it comes to the anticipated formation of coalitions in the key 2019 municipal elections. Both regional leaders and supporters of party co-founder Íñigo Errejón are said to believe that the centralized decision-making style of Iglesias would wrest autonomy from the regions and flexibility in any negotiations with potential electoral partners. At the regional level, particularly outspoken in favor of greater autonomy for coalition-building in the has been Andalucian Podemos leader Teresa Rodríguez, who has moved to incorporate all municipal Podemos affiliates into a single Andalucian regional party affiliate and says that Podemos needs to focus on reinforcing the strength of its own political message and branding in upcoming municipal and European parliament elections next year.